WELCOME, N.C. (January 16, 2019) – Richard Childress Racing (RCR) has renewed its partnership with Alsco, the premier linen and uniform rental business, into the 2019 NASCAR season. Alsco will serve as an associate partner for the full year on both No. 8 Chevrolet Camaro ZL1, piloted by Daniel Hemric in the Monster Energy NASCAR Cup Series, and the No. 2 Chevrolet Camaro, driven by Tyler Reddick in the NASCAR Xfinity Series. In addition to an associate partnership, Alsco will serve as the co-primary partner on Hemric’s Camaro ZL1 at Atlanta Motor Speedway, in conjunction with Alsco’s and RCR’s shared relationship with uniform supplier VF Workwear. 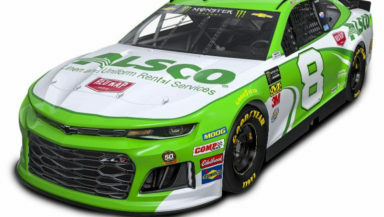 Alsco will also appear as the primary partner on Reddick’s Camaro during the Alsco 300 at Kentucky Speedway later this year. 2019 will mark the third year of the partnership between RCR and Alsco, the official uniform service company of the race team. Alsco’s uniform and linen services are valuable to the everyday operations of the championship winning organization. The 2019 NASCAR Xfinity Series season kicks off on Saturday, Feb. 16, at Daytona International Speedway, followed by the 61st running of the Daytona 500 on Sunday, Feb.17. For additional information on today’s announcement, and all that’s happening at RCR, please visit rcrracing.com. Alsco is a fourth-generation family owned and operated business, founded in 1889, that was recognized by the prestigious Hohenstein Institute for having invented the linen and uniform rental industry. Celebrating 130 years of business, Alsco provides linen and workwear rental services to customers that include restaurants, healthcare, automotive industry and industrial facilities. With over 180 locations and more than 20,000 employees, Alsco provides world-class service to over 355,000 customers in 14 countries. Learn more at www.alsco.com. Richard Childress Racing (rcrracing.com) is a renowned, performance-driven racing, marketing and manufacturing organization. Incorporated in 1969, RCR celebrates 50 years of racing in 2019 and has earned more than 200 victories and 15 championships, including six in the Monster Energy NASCAR Cup Series with the legendary Dale Earnhardt. RCR was the first organization to win championships in the Monster Energy NASCAR Cup Series, NASCAR Xfinity Series and NASCAR Gander Outdoors Truck Series and is a three-time winner of the Daytona 500 (1998, 2007, 2018). Its 2019 Cup Series lineup includes two-time NASCAR champion, 2017 Coca-Cola 600 winner and 2018 Daytona 500 champion Austin Dillon (No. 3 Dow/American Ethanol/AAA/Symbicort/Bass Pro Shops Chevrolet) along with Rookie of the Year contender Daniel Hemric (No. 8 Caterpillar/ Bass Pro Shops/Liberty National Life Insurance/Cessna/VF Workwear Chevrolet). Its Xfinity Series program includes defending Series Champion Tyler Reddick.